Clothes for college girls, Delineator, September 1930. Center is bolero suit 3412. In Part 1, I mentioned the 1930 bolero as an option for older women who were not yet completely comfortable with the higher waist and figure-revealing new Thirties’ fashions. However, the bolero jacket (or, in some cases, a dress that gave the illusion of a bolero) was also worn by young women. Not to mention pajamas! Hostess pajamas with a bolero top — and similar pjs for “little sister” were featured in the Christmas suggestions; Delineator, December 1930. 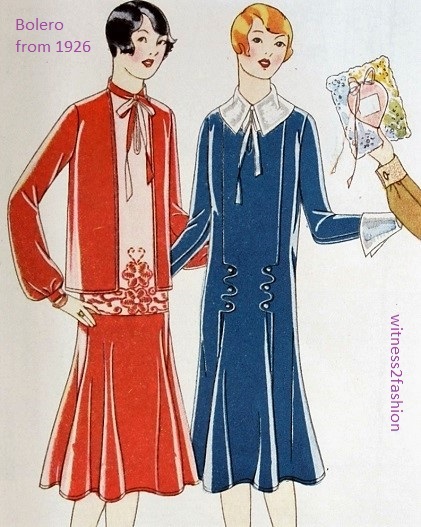 A “youthful” bolero suit (3562) and an interestingly tucked wrap dress (3548) from Delineator, December 1930. A short, removable bolero is featured in this suit from July, 1930. Butterick 3323. Another bolero look from July 1930, Butterick 3315 has a false bolero “effect” in front, actually part of the dress. Left, Butterick 3209 has a long, 1920s’ cardigan jacket, but Butterick 3242, right, has a bolero that reaches just below the waist. The two-tone bodice top creates a long line and draws attention upwards to the face — always a good idea for theatre/opera costumes. Three different dressy approaches to the jacket ensemble, from May 1930. Butterick patterns from Delineator magazine. The bolero tied at the waist (left) appeared in evening ensembles in 1931. Butterick 3323 has a formal afternoon look to me, but the description suggests that the bolero jacket is considered less formal than the short-sleeved dress beneath. May 1930. Butterick 3238 is a suit with a hip-length jacket — also called a “bolero.” [It is buttonless and curved at the hem.] 1930. Butterick 3229 is a more formal, lace ensemble, “equally smart at tea or dinner.” The jacket has a sleeveless dress under it. 1930. A year later, boleros also appeared with more casual wear. Some of these are cotton day dresses; the two at right have bolero jackets. May, 1931. Butterick 3784 (left) is a bolero jacket and skirt pattern, with separate blouse. At right, dress 3759 is shown in paisley print with a false bolero jacket. Delineator, April 1931. Even more casual, Butterick 4229 is described as a house dress with removable bolero. Three house dresses — one with a removable bolero — Butterick 4229. Delineator, December 1931. Next: Part 3. The bolero used with evening wear.